Letgo, the mobile app that allows users to buy and sell used good locally, has released a series of new ads, encouraging people to sell the stuff they don’t need anymore. One of the spots features a family pushing a baby grand piano into the reception of a hotel, willing to use it as a payment for their stay. “This should cover your best room,” the mother tells the receptionist, pointing to the musical instrument, while her husband and two kids are leaning against it. The employee answers they don’t accept pianos and urges her to sell it on letgo and turn it into money, which she does and concludes that “that was easy”. 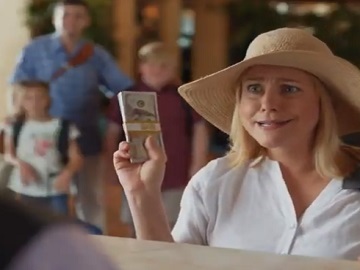 “Less stuff, more living,” an onscreen line reads at the end of the spot, which also features the woman’s son telling her she’s the best mom and suggesting to take a pool. “Live and letgo,” the voiceover finally adds. Launched in January 2015 by Alec Oxenford, former CEO of OLX, letgo raised, in the same year, US$100 million and was later labeled as “the biggest and fastest growing app to buy and sell locally”. While it initially targeted the US market, the app launched internationally: in October 2016 it launched in Canada and in November 2016 in Norway. The company enlisted ad agencies Crispin Porter + Bogusky Miami and CP+B Miami to create ad campaigns for it. As of January 2018, the Letgo app had about 75 million downloads, compared to 30 million in August 2016.